Choice of smart polished glass sterilising jars from Hair Tools. 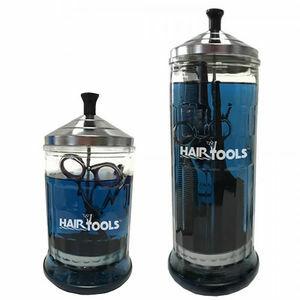 The Hair Tools Glass Sterilising Jar is made from high quality polished glass and has a stainless steel cap with inner tray. It's available in two sizes, with the small being 20cm in height, with a capacity of 621ml. The large stands at 29cm and holds 1049ml. Both feature a rubber non-slip base for stability. Both are perfect for tools like brushes, combs and scissors and also for various manicure implements. Complete salon hygiene system with a super concentrated germicide. Available in 16 or 64 fl oz (473 ml or 1.89 litres).